A third convening of the Cultivating the Globally Sustainable Self Summit Series at James Madison University brought together an international group of scholars, practitioners, and assessment specialists. 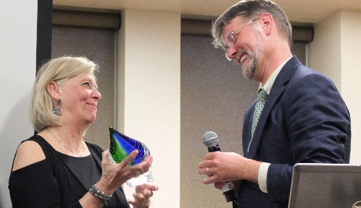 Deputy Vice-Chancellor Dr. Cecilia Christersson from Malmö University in Sweden delivered the keynote address and received the annual Sustainable Visions and Values Award from the International Beliefs and Values Institute. The Summit Series is aiming to develop a global research-to-practice program and disseminate the project learnings through publications, internet-based resources, and film. One of the Summit Series research-to-practice projects is the development of a Global Studies curriculum and accompanying learning assessment tool. The curriculum will be adaptable in terms of learning platform (in classroom, online, or combination) and duration (i.e., short-term program or a 3 credit hours course).